After the last three weeks where you have seen discussion of sign language-related topics, in the blog for this week we thought we would take the opportunity to do a profile of the BSL team at Heriot-Watt University – a who’s who of the ten members of the team, and to give an overview of what we do here and our research interests. Below you will see a short profile of each staff member and PhD student in the BSL team, with links to webpages that provide further information about their work where possible. If you click on the link attached to their name, you can also watch their bio presented in sign language. The most recently appointed member of staff is Professor Jemina Napier, Chair of Intercultural Communication. She is a signed language interpreter who grew up and worked in London before moving to Australia, where she lived for 15 years and began her career in teaching and research. She recently returned to the UK to take up her position at Heriot-Watt University, where she teaches in the BSL/English Interpreting 4-year undergraduate programme on courses including ‘Deaf People in Society’ (covering topics such as Deafhood, Deaf identity and culture) and practical interpreting and translation skills. She also teaches in the European Masters of Sign Language Interpreting (EUMASLI) programme, which is offered jointly between Heriot-Watt University, Magdeburg University in Germany and Humak University in Finland. EUMASLI has 24 deaf and hearing students from all over the world who are already seasoned interpreters, and have enrolled in the programme to explore and examine signed language interpreting at an advanced level. Jemina’s research interests focus on signed language interpreting, and deaf-hearing cross-cultural communication. She has conducted research on legal, medical and educational interpreting (for more information on her research and publications see her web research profile) and will be commencing two new key projects over the next coming year: (1) Justisigns, in collaboration with universities in Ireland, Belgium and Switzerland, to focus on legal interpreting across Europe, and (2) Examining experiences of deaf and hearing children when engaging in language brokering (non-professional interpreting) for Deaf members of their family in comparison with young people and spoken languages. She is also keen to explore other opportunities for research on deaf-hearing relations and comparing spoken and signed language interpreting. Rita McDade is a Teaching Fellow and the longest standing member of the BSL team at Heriot-Watt. Rita began her work in the Deaf community in 1985 as a Liaison Officer in a Deaf organization, and worked in various roles until she developed a keen interest in teaching and learning, especially in relation to languages, linguistics, translation and interpreting. Rita was one of the first people in Scotland to be involved in teaching deaf (relay) interpreters, and also to work as a deaf interpreter, and she is still very passionate about that work. Her research interests focus on intersections between language and culture and power dynamics in cross-cultural communication that influence sociolinguistic variation in how signs are produced. Although she has an interest in many issues in relation to deaf-hearing cross-cultural communication, she focuses most closely on research on teaching and learning and in particular on how students begin to learn early on in their course, which cements their future learning and development. At Heriot-Watt University Rita teaches in the undergraduate BSL/English interpreting programme, and five years ago she initiated offering BSL classes as an elective to any student who is interested in taking the course. Those courses are very popular and well attended by students from across the university, so it is Rita’s hope that both the BSL elective courses and the BSL undergraduate programme will grow and develop. Professor Graham Turner is head of the BSL section and Chair of Translation. He has been at Heriot-Watt since 2005. At that time, the BSL work that had been initiated by others in the Department (see overview below on the History of BSL at Heriot-Watt) was still on a small scale, so his goal was to grow the area of BSL and sign language research at the university. Over the last eight years since his arrival the BSL section has grown significantly in size, and now includes ten different members (as you will see featured in this blog post). Graham works with the team on various research projects on sign language, signed language interpreting and translation, Deaf culture and heritage, and a range of other topics. For more information about Graham’s research and publications, see his research web profile. Gary Quinn is a Teaching Fellow and Coordinator of the BSL/English Interpreting undergraduate honours/MA programme. At Heriot-Watt he teaches BSL and sign linguistics, and in previous years was also responsible for teaching two cohorts in the Training of Trainers (TOT) course, to train deaf people as BSL teachers. He is currently conducting his PhD research on BSL grounding, examining how deaf people align with one another in signed interaction and engage in turn-taking appropriately. See his research web profile for other publications. Gary has been one of the key investigators on a research project conducted in collaboration with Rachel O’Neill and Audrey Cameron and the Scottish Sensory Centre, Moray House School of Education, University of Edinburgh in the development of science signs for deaf school children. Click here to see Gary talking about the project in BSL (with captions). Dr Svenja Wurm is a Lecturer in BSL and Translation Studies and is coordinator of the EUMASLI programme. She grew up in Germany and has been living in the UK for 15 years after coming initially to study in the BSL/English Interpreting programme at Wolverhampton University. Rather than working professionally as a signed language interpreter, she decided to pursue her interests in translation theory and research, and enrolled in an MSc in Translation Studies at Edinburgh University. In 2005 she commenced her PhD studies at Heriot-Watt where she explored the process of signed language translation from written English into BSL. In her role as Lecturer, in addition to coordinating the EUMASLI programme, she teaches in the undergraduate programme: Translation & Interpreting Studies, Subtitling and English/BSL Translation Skills. Svenja also coordinates the EdSign Lecture Series, which is co-hosted by three universities in Edinburgh (Heriot-Watt University, Edinburgh University and Queen Margaret University) and delivers a programme of lectures on a range of Deaf and Interpreting Studies topics that are open to the Deaf community, interpreters and BSL and interpreting students. Svenja’s research interests focus on English/BSL translation and interpreting processes, and a newer area of interest is in relation to multimodality and how people communicate using different modes of speech, sign and written text. She is also interested in deaf literacy and the various ways that deaf people communicate in BSL or English. For an overview of her publications, see her research web profile. Robyn Dean is a third year PhD student from Rochester, New York in the USA, and has been a practicing interpreter for 25 years, specializing in medical and mental health interpreting. Her work as an interpreter educator has focused on ethical decision-making (and she developed the Demand-Control Schema with her collaborator Robert Q. Pollard). Robyn’s PhD research is also exploring ethical decision-making for interpreters, and she is being supervised by Graham Turner, Svenja Wurm and Jemina Napier. Xiao Zhao is a second year PhD student from China and is being supervised by Graham Turner and Svenja Wurm. (She is learning BSL and has basic Chinese Sign Language skills). Her research interest is in signed language interpreting on television in China, and the different perceptions of different stakeholders (e.g., the media, deaf people and signed language interpreters in China). Xiao chose to come to Heriot-Watt is that she felt that it is one of the few places in the world where one can conduct research on signed language interpreting that is relevant to your home country. The reason she has an interest in this area of research is because signed language interpreting in China is growing exponentially and there are many discussions of the importance of this provision in China, but they do not have enough resources to train interpreters, and not enough knowledge about best practice in signed language interpreting for the Chinese context. Therefore she sees this as an opportunity to immerse herself in a new field of study in order to learn something. 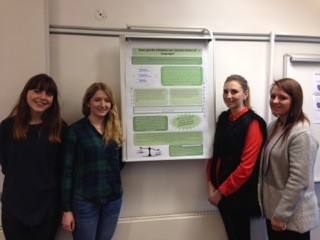 Yvonne Waddell is a first year PhD student from Scotland and is being supervised by Jemina Napier and Isabelle Perez. She has been qualified as a BSL/English interpreter for 3 years, and works in a variety of community and educational settings. She sees the need for more research on signed language interpreting in order to inform and influence best practice in signed language interpreting, which is why she has chosen to come to Heriot-Watt to undertake a PhD. Her research interest is to examine how behavioural decisions made by interpreters in different situations are perceived by hearing professionals and the consequent impact on deaf participants in interaction. Clare Canton is a deaf first year PhD student from Scotland and is being supervised by Jemina Napier and Graham Turner. Clare was the first deaf person to be registered as a qualified BSL/English interpreter in Scotland, and interprets in a range of settings, including medical, mental health, with deaf migrants, and at international conferences. With her company Beyond BSL, she has provided training and support for learners of BSL in one-to-one and group contexts, as well as mentoring, for example in relation to theatre interpreting. She also delivers interpreter training on topics such as deaf-hearing interpreter co-working strategies. As a PhD student, Clare is interested in exploring language brokering experiences of deaf and hearing people in the Deaf community who have grown up brokering for family members. Stacey Webb is also a new first year PhD student from the USA and is being supervised by Jemina Napier and Svenja Wurm. She is an ASL/English interpreter of many years experience, and also teachers interpreters in various courses. Thus her research topic focuses on interpreter education, where she hopes to explore the training of interpreters in more depth.